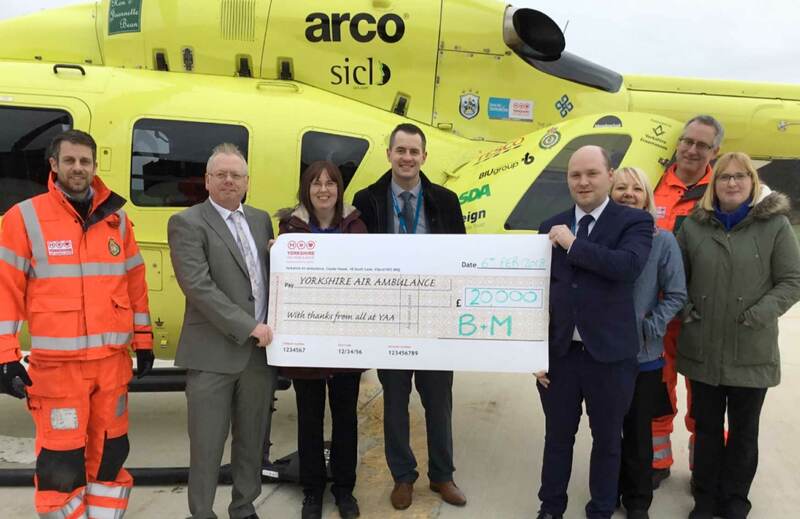 B&M stores across West Yorkshire have raised a staggering £20,000 for the Yorkshire Air Ambulance. The rapid response emergency charity was chosen by colleagues from the area as their charity of the year for 2016/17. The donation will help them continue to provide lifesaving rapid response emergency to 5 million people across the whole of Yorkshire. The charity currently operates two helicopters and attends over 1,300 missions a year, an average of 3 incidents every single day. B&M Area Manager, James McCluskey, said: “As part of our national Community Fund initiative colleagues in each area are asked to nominate local charities to support and in West Yorkshire we chose the Yorkshire Air Ambulance. “We look for local causes which will make a real difference to our customers, our environment and to the communities in which our stores are based. The YAA is based in our area and we all know just what a vital service it provides every single day of the year. Paul Gowland, YAA’s Director of Fundraising, said: “To keep both Yorkshire’s Air Ambulances maintained and in the air, the Charity need to raise £12,000 every single day, which is the equivalent of £4.4 million a year. The generosity that we receive really is the life blood of the charity and we cannot thank B&M enough for their fantastic donation. “The money that has been donated will be vital in helping us to continue to save lives across the region. We are an independent charity, so donations such as this from B&M are invaluable to us and we are very grateful to them for their support."